With no Internet at home until just this past weekend (yes, we finally got hooked up, but no I'm still not on very much), I have had more time to read. 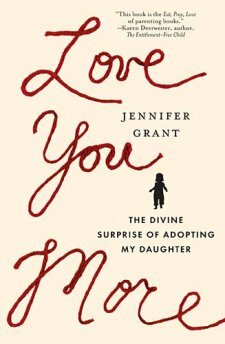 Love You More: The Divine Surprise of Adopting My Daughter was a book I actually signed up to review quite some time ago. However, I didn't have the correct cord to connect my Kindle Fire to my computer so it had taken me awhile to even download it. Finally, I got it downloaded and I was SO happy to have read this book. Honestly, this book is one of the best adoption books I have ever read! Jennifer Grant is the biological mom to three and shares the joys, hardship, and journey of adopting her 4th child, a daughter. She does it all with a refreshing honesty about adoption that I believe is hard to find. Throughout the book is a sprinkling of humor that made me want to keep reading page after page. As an adoptive mama, I thought that perhaps I had read all the books I needed to read in regards to adoption. It wasn't until I read this book, that I realized how very wrong I was. This is not a book that you should only read before the adoption journey (although I do think it would be helpful), rather this book is full of wisdom for after the journey as well. "I couldn't have foreseen that adopting my daughter would require her to experience a very real loss and that this loss would remain with her, and with me. Sometimes that loss would be as innocuous as a book on a shelf, sometimes as heartening as a conversation among old friends, and sometimes as violent as a crash of lightning." If you are considering adopting at all, or if you have adopted, or even if you know someone who adopted, I highly would suggest for you to read this book. It will be well worth your time and leave you wiping away the tears with a smile on your face! I received a complimentary copy of this book from BookSneeze.com I was not obligated to write a positive review and all opinions expressed are my own.